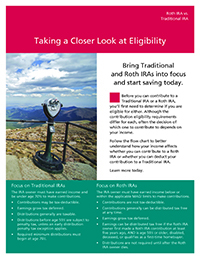 Many questions may arise when deciding whether a Traditional IRA or Roth IRA is the best option for you. 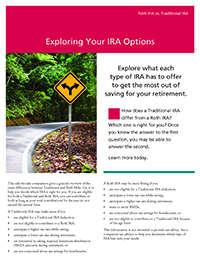 Below are several printable documents that are great resources in helping you decide the best solution for you. 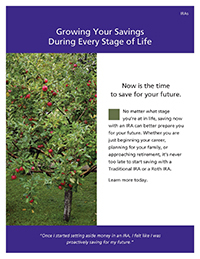 Find out if you can contribute to a Roth IRA and start saving today. 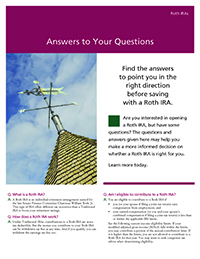 Find the answers you need before gearing up to save with a Roth IRA. 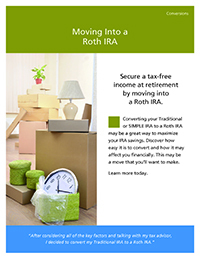 Saving with a Roth IRA has never been easier. 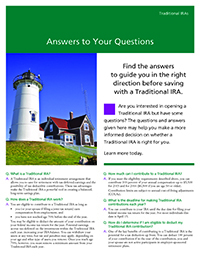 Find the answers you need before saving with a Traditional IRA. 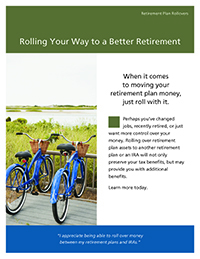 With all of the retirement plan portability options available today, don’t pass up the chance to better your financial future.